Burns Harbor, IN – J&F Steel Corporation, a multi-facility carbon steel coil distributor and coil processor has installed a new state-of-the-art Braner/Loopco Cassette Leveler Servo-Feed Precision Multi-Blanking Line in its newly expanded flagship facility in Burns Harbor, IN. The new Multi-Blanking Line has the ability to convert 60,000# bare and critical surface coated cold rolled steel coil in gauges from .015" through .135" into 72" wide x 12’ long pattern sheets or precision multi-blanks as small as 5" wide x 12" long. 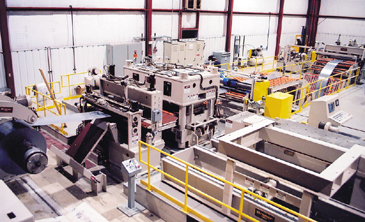 In addition to the new Multi-Blanking Line, the J&F facility contains four (4) Braner/Loopco Turret Headä slitting lines (72", 60", 52", & 24"), and three (3) Braner/Loopco "Turret Stacker" Automatic Packaging Lines. Hydraulic "Cassette" Leveler: The new Multi-Blanking Line is equipped with Braner/Loopco’s precision "Cassette" Leveler that employs advanced electro-hydraulic motion-control technology to position 9 adjustable back-up flights and 17 work rolls to produce panel-flat sheets and blanks. Hydraulic cylinders with linear electronic transducers (rather than mechanical jack-screws and sliding wedges) position the Leveler back-up flights and work rolls to correct strip shape defects such as coil-set, wavy-edge, and center-buckle. Computer controls are employed to independently position the 18 back-up cylinders. Independent control of the entry and exit ends of the back-up flights allows the entry work rolls to be positioned and contoured for aggressive shape correction at the entry end while maintaining parallel exit end work rolls. This feature allows precise shape correction without overworking the strip. Independent positioning of the back-up flights across the work roll face allows the work rolls to be "tilted" from side-to-side to correct asymmetrical shape defects. The J&F Leveler is equipped with two (2) interchangeable "Cassettes": a 1.250" x 6-Hi Cassette, and a 1.750" x 5-Hi Cassette. The smaller Cassette is utilized to process a gauge range from .015" to .060", while the larger Cassette is utilized for leveling .030" through .135" materials. In addition to providing an extended leveling range, the Cassette Leveler design simplifies Leveler maintenance by allowing work roll and back-up maintenance to be accomplished outside the Leveler frame rather than inside the frame where many parts are inaccessible. The Leveler Cassettes are installed and removed from the Leveler frame via an "Indexing Cassette Injector Car". The Injector Car allows one Cassette to be ejected and another installed in about one-minute. A Powered "Cassette Opener" attached to the Injector Car simplifies maintenance by opening an off-line Cassette like a "book", exposing the work rolls and back-ups. Precision Multi-Blank Slitter: The J&F Multi-Blanking Line employs a quick-change two-head "Turret Head"ä slitter located immediately after the Cassette Leveler (before the looping pit) to slit the leveled material into multiple strips. The Turret Head slitter is an accurate, reliable, and maintenance-free slitter that with its precision shimless tooling consistently produces strips to ±0.002" width tolerance. 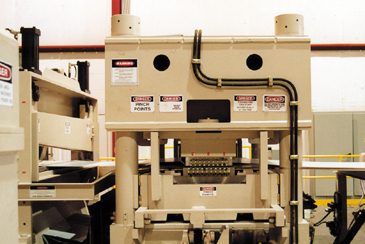 While most multi-blank slitters require that the line be shut down during the preparation of a slitter set-up, the Turret slitter allows J&F to prepare the next multi-blank slitter set-up while the line is running. 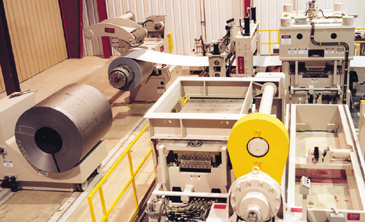 The ability to prepare the next set-up while the line is running significantly improves multi-blanking line productivity by virtually eliminating down time related to slitter set-ups. 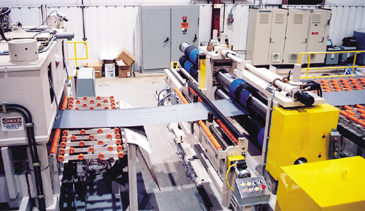 Once the off-line slitter set-up is completed, production down time related to changing slitter heads is one-minute.